When I first looked at the OBBC presentation from 2009 to the Ottawa Field Naturalist Club I was amazed. It was an incredible wealth of information from only a couple of years of observations. This information (after five years of data) must be so much more robust! What a great organization to partner with if you ever wanted to show the importance of your patch of forest or that scrubby field that has never been developed. I was thinking that it could be an amazing tool for those who were opposed to the new provincial bridge - showing how the locations they were proposing were some of the last havens for urban birds (end of the Aviation Parkway - Kettle Island, end of Rockcliffe Parkway - Green's Creek, Petrie Island Corridor). Let's take the Aviation Parkway - Kettle Island Corridor for an example. From the 2009 OFNC presentation it shows us that around 16 - 22 Native Bird Species have been observed there (after three years of field surveys) and of those bird species three or more are conservation priority species. This area at the end of the Aviation Parkway (where the Space and Aviation Museum and the Rockcliffe Airport are located) has a Partners in Flight Priority Score from 212 - 275 (by adding up all the individual species priority scores) which is on the high end for the City of Ottawa. 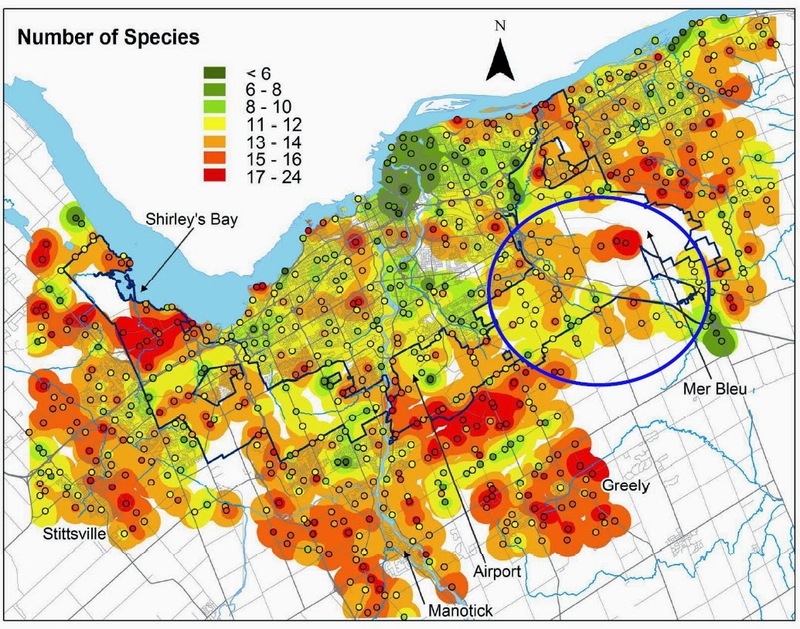 There are 10 - 13 species with declining populations in this area. In the following maps (just ignore the blue circle around the Mer Bleu - Greenbelt area) you can see the end of the Aviation Parkway and Kettle Island (in white) - close to the North arrow. 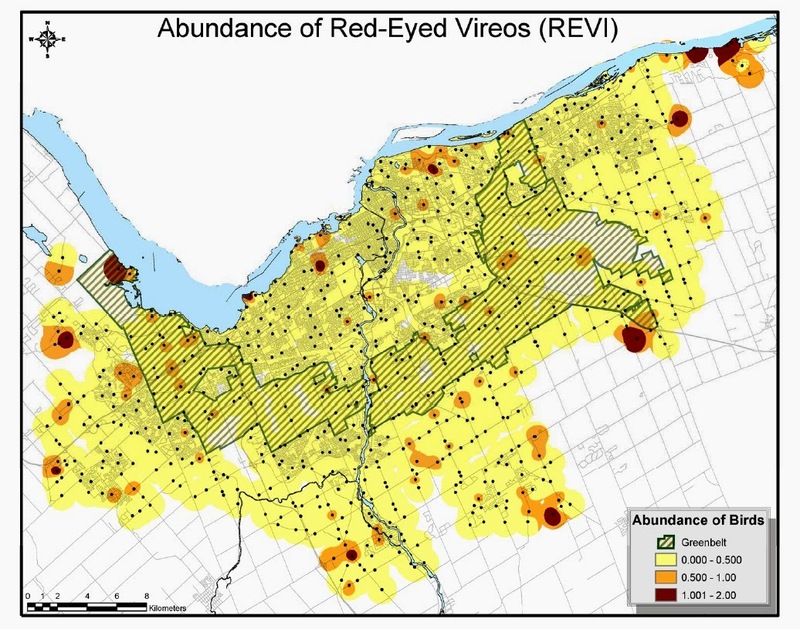 You'll see below the abundance of specific bird species - all at least present in or around the Aviation Parkway and along the Rockcliffe Parkway in that area. While they are not high (compared to areas around the Greenbelt and suburban areas) they are still observed and their presence inside the urban core (within the Greenbelt) is a wonderful urban asset for those who cannot travel easily to the outskirts or Conservation Areas and Parks in more rural areas. There have also been some observations of grassland birds (Savannah Sparrows), over five species of open-shrub birds (including the Northern Cardinal, along with the SOSP and AMGO shown above) and a few forest species (including American Redstarts) that visit the Manor Park area and the forest strip between the Rockcliffe Parkway and the Ottawa River (just east of the Space and Aviation Museum). You'll also see that the Green's Creek corridor (which is part of the eastern Greenbelt) has a high number of bird species. Petrie Island does not have elevated numbers of birds and it would be interesting to find out more about this area and the data collected. As you can see this information could help inform development projects like the Interprovincial Bridge location and or other development proposals including larger scale ones like Lebreton Flats. It would be interesting to see what five years of data could provide in terms of observations. Speaking about large-scale development proposals - it might be a great study if data could be collected from before, during and after the new Rockcliffe Lands Redevelopment occurs! 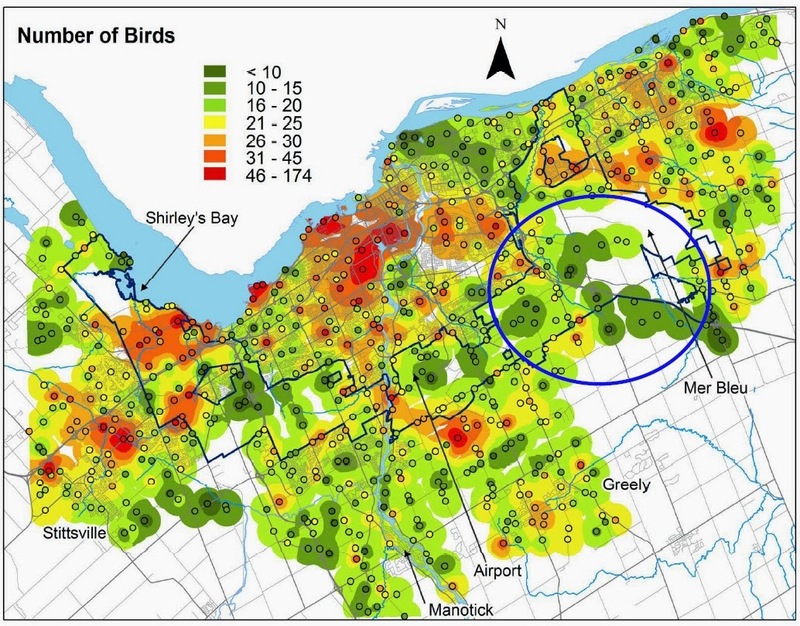 And perhaps the OBBC data could be linked up with the City of Ottawa's Urban Natural Features Strategy to show how even small green spaces and corridors are providing habitat for birds? I wonder what has been found out about Pleasant Park Woods or the NRC forest in Rothwell Heights? 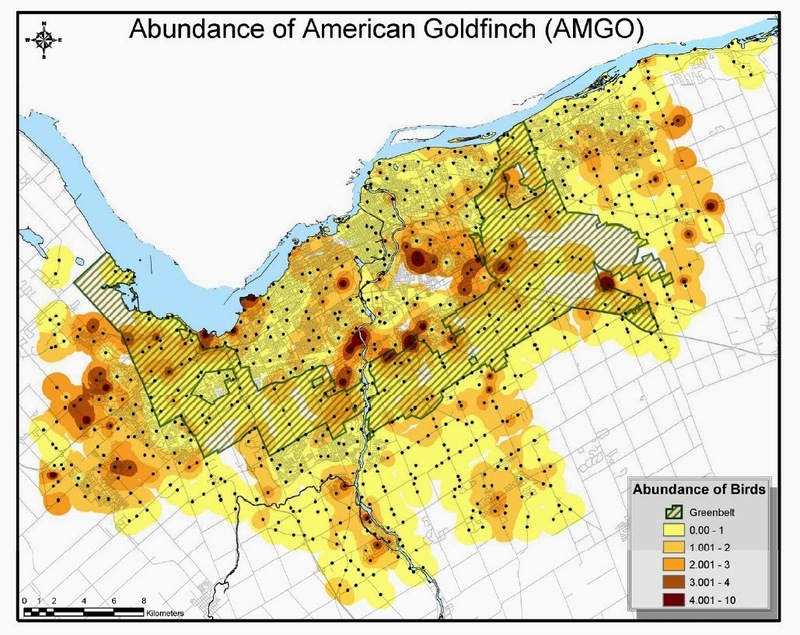 So if you are curious - take a look at the 2009 presentation and new data as it comes in from the Ottawa Breeding Bird Count. Perhaps you may even want to volunteer with them when they start up again next spring? 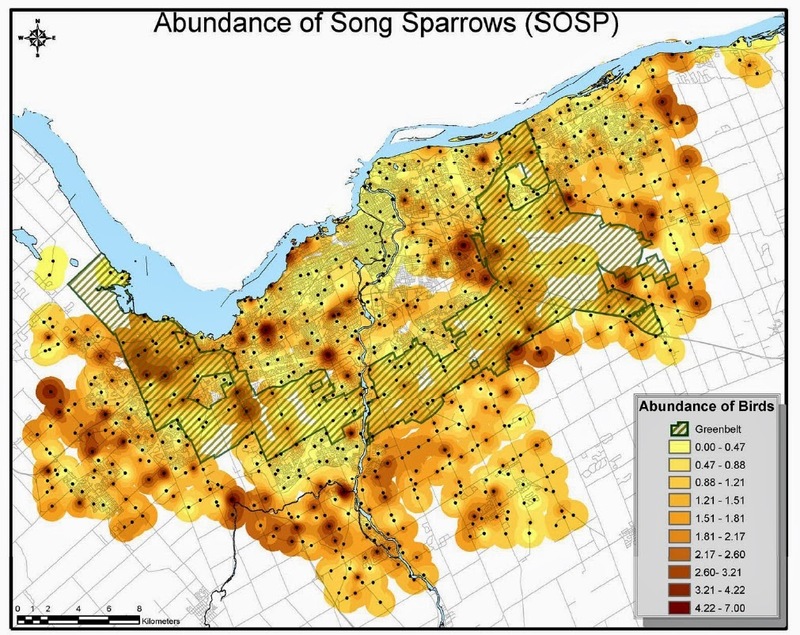 Ottawa is going to learn a lot about its native population of birds thanks to the data collected through this project!